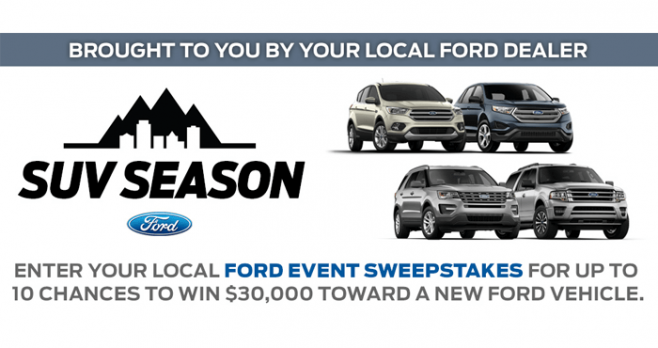 Did You Entered Your Local Ford Event Sweepstakes 2016 Yet? It’s SUV season! 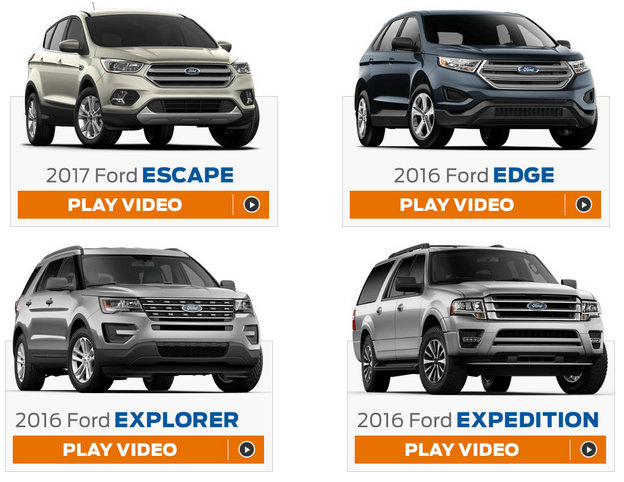 Be sure to enter your local Ford Event Sweepstakes 2016 by watching short videos at FordEventSweepstakes.com for up to 10 chances to win a 2016 Ford vehicle of your choice. One lucky grand prize winner will have the chance to drive home their choice of a 2016 Fusion, 2016 Focus, 2016 Escape, 2016 Explorer or 2016 F-150. The prize is awarded in the form of a $30,000 voucher good for the purchase of one of these 2016 Ford vehicles. During the Sweepstakes Period, you may visit www.fordeventsweepstakes.com to enter the Ford Event Sweepstakes 2016. You will be presented with four videos. For each video you watch, you will earn an entry into the Grand Prize Drawing. Get started by watching a first video in its entirety. Then, you’ll get access to the official entry form. Follow the instructions to complete and submit the registration form for a chance to win $30,000 toward a new Ford vehicle. Finally, watch remaining videos to earn more chances to win. On the “Thank You” page, you will be encouraged to share the Sweepstakes with your friends and family members. You can share on Facebook, Twitter, Google+ and/or Pinterest. Each time 5 people register for the Sweepstakes via your unique URL, you will earn an additional entry into the Grand Prize Drawing, up to a maximum of 5 additional entries throughout the Promotion Period. You will also be invited to enter the bonus drawing for a chance to win a $500 cash prize. To enter, simply log into your Facebook account and post a comment about which Ford vehicle you’d llove to win and why. As a result, you will earn an entry into the Bonus Drawing. The Ford Event Sweepstakes 2016 is open to legal residents of the 50 United States and the District of Columbia. In addition, entrants must be 18 years of age or older and have a valid driver’s license at the time of entry. Starts at 5:00:00 pm Eastern Daylight Time on September 7, 2016 and ends at 5:00:00 pm Eastern Daylight Time on January 3, 2017. Limited to a maximum of one entry per activity per person. This Sweepstakes is sponsored by Ford Motor Company and is administrated by Flashpoint Communications.